Missing For 112 Years, First Porsche Is Found In Warehouse : The Two-Way The P1 that Ferdinand Porsche helped develop was an electric vehicle that could chug along at 22 mph. It was discovered in an Austrian warehouse and is going on display at the Porsche museum in Stuttgart, Germany. The P1, now known as the "first Porsche." Even the famed German automaker concedes that it "may resemble an old horse-drawn carriage." But the recently rediscovered "first Porsche in the world" — dubbed the P1 — was a technological marvel for its time. It "included a compact electric drive weighing 286 pounds," writes the automotive news site Jalopnik, and could chug along at 22 mph. The car was found, according to Porsche, in an Austrian warehouse where it had apparently been left untouched since 1902. 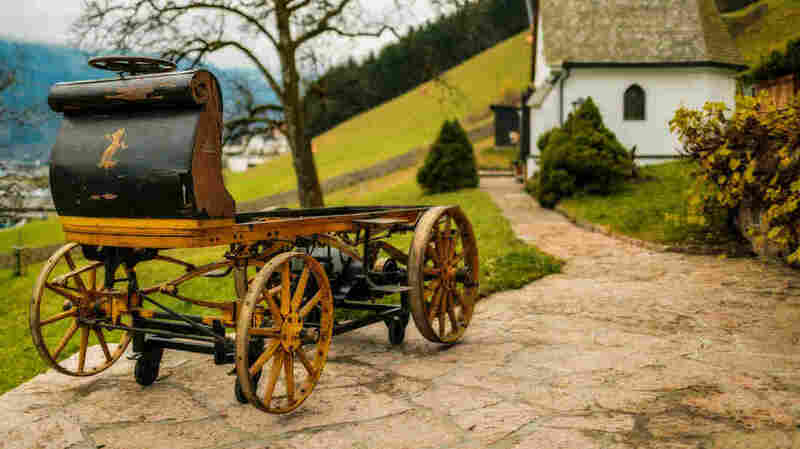 "The result of Ferdinand Porsche's vision, the 'Egger-Lohner C.2 electric vehicle,' rolled onto the streets of Vienna for the first time on June 26, 1898, and Ferdinand Porsche made sure that he would take credit for the vehicle's design in a most unusual manner: He engraved the code 'P1' (P for Porsche, number 1) onto all of the key components, thus giving the vehicle its unofficial name." USA Today says the car's "first serious test came in a race for electric cars in September 1899. The contestants had to complete 24 miles with three passengers on board. Ferdinand Porsche piloted the P1 across the finish line 18 minutes ahead of the second-place racer, the car company's history shows. Perhaps more important, P1 was among fewer than half the racers able to finish. The others dropped out because of technical problems." Porsche and his son would go on in 1948 to found the car company that still bears his name. According to Fox News, the P1 was discovered "last year in a warehouse at an undisclosed location in Austria." It was then bought "by one of [Ferdinand] Porsche's living relatives" for the museum. It's now going on display at the Porsche Museum in Stuttgart, Germany. The unveiling is set for Friday.